Groundwater is the lifeblood of the Amargosa. Get to know the why it is so important, and how humans have an impact on it. In the harshest desert in North America, it all comes down to water. The reason our region is so unique and irreplaceable is because it is rich with groundwater resources. A vast carbonate aquifer underlies the Amargosa Basin, bubbling forth at springs from the Oasis Valley and Amargosa Valleys in Nevada to the Shoshone-Tecopa corridor to Saratoga Springs and its final journey to Badwater. Each of these springs harbors the amazing life that has made the Amargosa one of the most biodiverse locations in the Western Hemisphere. The plants and mammals, birds and fish that call these springs home lie in a delicate balance between water and desert. Even the slightest perturbations can substantially alter the spring habitats, and imperil species with the smallest of distributions. A typical discussion about a watershed will describe the path of surface runoff. But the Amargosa Watershed is much more complex. While the hyper-aridity of the region means that surface runoff contributes a negligible amount to the hydrologic system, we sit on top of an enormous aquifer, and thus groundwater discharge at springs is the primary source of our water. As a result, we focus on what happens to our groundwater. Where is it going? Who is using it? Are the springs which all life in the Amargosa depends on being affected by groundwater pumping, even at distant locales? These questions must be integrated to every land and water use policy which faces decision-makers in the northern Mojave Desert. A slight change in groundwater levels can have catastrophic effects on our endangered species. Due to the importance of groundwater for the River and local springs, we study the hydrology of the Basin extensively, trying to build a model of how the water flows, and keeping track of any changes to flow levels. With the establishment of the Amargosa Wild and Scenic River in 2009, there arose a need to better understand the hydrological structure of the Basin – identifying where the water for the river comes from and how increasing industry and populations nearby might affect the flow of the river. Thus came the State of the Basin Report. First published in 2012 and updated in 2014, this comprehensive report came from years of data collection and analysis. 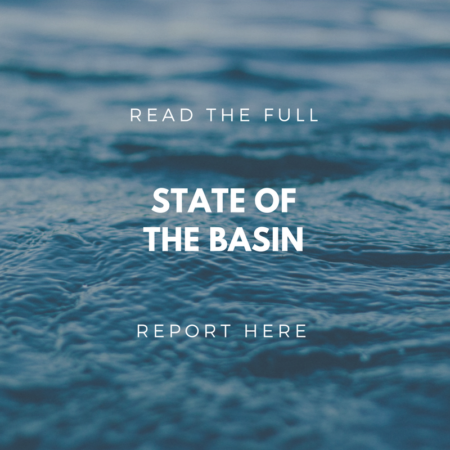 What information is in the State of the Basin Report (SOBR)? • Update of work conducted since the 2012 SOBR. • Up-to-date hydrologic information and a current, real-time snapshot of water resource conditions in the Middle Amargosa Basin area. • Recommendations for long term monitoring and resource management for inclusion in a management plan for the Amargosa Wild & Scenic River (WSR). Why is the SOBR important? • The Bureau of Land Management is developing a management plan for the Wild and Scenic portion of the Amargosa River. • The SOBR provides the hydro-geologic characterization of the basin, which will inform the management plan to assure that monitoring is conducted in a meaningful way (and before potential irreversible impacts from future groundwater development occur). • There have been few regional hydro-geologic investigations in the California portion of the basin, unlike the Nevada portion of the Amargosa River Basin that has been well-studied. The Amargosa River Basin, which spans two states, three counties and one National Park, is one of the most important desert waterways in the southwestern United States. In the Northern Amargosa River Basin groundwater is already over-allocated. Although pumping does not currently take place at the full amount entitled to by water rights holders, considerable impacts to the groundwater reservoir and associated springs could occur should those holders eventually fully exercise their water rights. Groundwater usage within the Northern Amargosa River Basin has steadily increased over the past 25 years, and the addition of a new industry to the area (solar) will likely provide additional pressure on the groundwater resource. Except for portions of the river in the Amargosa Canyon area in California, and near Beatty, Nevada, the Amargosa River typically flows only after periodic storms. In those areas where the river is usually dry, the flow of water, where present, is in the subsurface. The river is a groundwater-fed surface water body, and relatively small variations in the groundwater surface elevation can have considerable effects on the ability for the river to maintain surface flow. This report focuses on the Middle Amargosa Valley River Basin, an area encompassing nearly 1,000 square miles. Spring flow, river flow, and groundwater level monitoring data were collected from the Middle Amargosa River Basin. Isotope sampling was conducted in selected springs in the Tecopa area. Seepage run monitoring was conducted on the stretch of the Amargosa River from Tecopa to the Dumont Dunes. Basic water quality data were also collected at all discharge, elevation and seepage run monitoring points. The source of heat in the local thermal springs in the Amargosa Basin is likely deep circulation of water along deep-seated faults as opposed to the presence of a shallow heat source. Decreases in groundwater level and associated underflow in the northern Amargosa basin and Pahrump Valley (both in Nevada) could affect springs in the Middle Amargosa Basin and the Amargosa River fed by those springs. An effective monitoring program for the WSR will include sites well away from the Amargosa River, due to the unique hydrology and expansive area that contributes to the river. From Pahrump Valley via the shallow divide into California Valley then toward the Amargosa River. Recommendations for an adaptive approach to management of the Amargosa WSR that is flexible enough to evolve with our ever-growing knowledge of the Amargosa River and the groundwater system that feeds it.